Firstly, thank you all for your lovely and supportive comments on my last post! My power is back on and I’m back in the kitchen and appreciating and loving every single minute of it. So. I didn’t vote, but I did make pancakes. Not just any pancakes, but healthy pancakes. With pumpkin and all kinds of awesome spices and things. Oh and there’s oatmeal in them, so they have negative calories, I think. Or something like that. So regardless of who wins the election, and whether you’re happy about the result or not, you can totally be happy when you make these pancakes. And happier when you finish eating them, because you did something good and healthy for yourself. *Edited on 12/18 with improvements to recipe! In a large mixing bowl, whisk together the flour, oatmeal, baking power, spices and Splenda or sugar. Add the remaining ingredients and stir until combined. Spray the pan well with Pam, or use a small amount of oil. When the pan is hot enough, spoon some of the batter onto the frying pan and spread it slightly into a circle. When the pancakes are set on top, flip it and fry for a couple of minutes until both sides are golden brown. 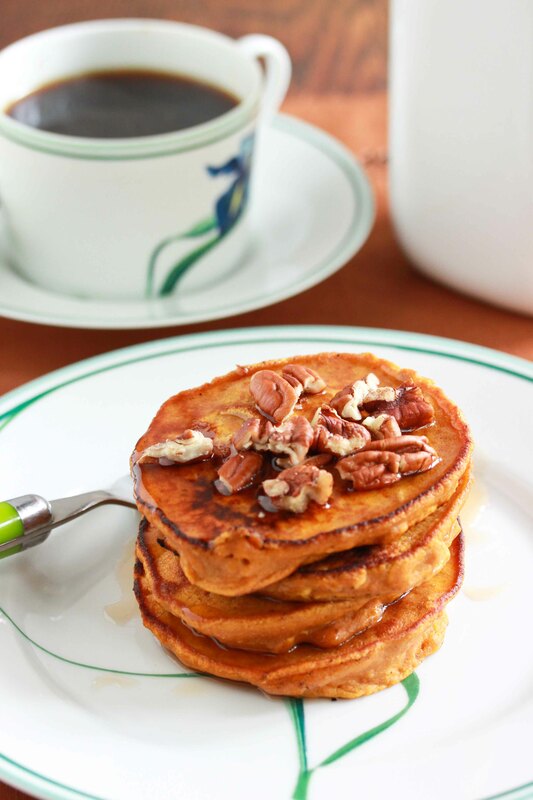 Serve hot with maple syrup, agave syrup or sugar free maple syrup and a sprinkling of chopped toasted pecans. these look SO delicious! and the recipe is simple. i love it. Wow those looks so delicious, I want to eat them now. Yum! This is definitely something I would make. Time to replenish my pumpkin puree stock…also, bored of your diet recipes? No way. I like these the best because I know you’ve tested them yourself! 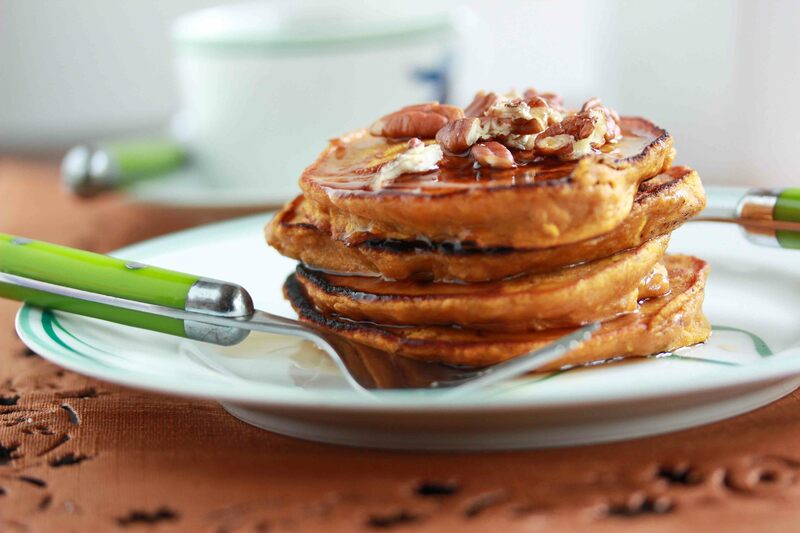 there was a place in my college town with pumpkin oatmeal pancakes and i’ve always wanted to try to replicate them at home! THANKS for this recipe!! 🙂 going to try it out this weekend! So glad you have power back. I’m still waiting for my power to come back (sigh). The pancakes look luscious. These look delicious and it’s great to think seasonal when cooking!! How many pancakes or servings does this make, please? Probably about 15, depending on the size. Enjoy! Love, love, love this! I could eat this every single day all year long. 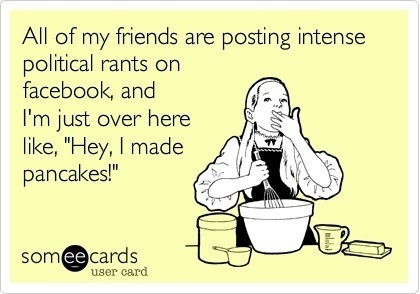 Plus, it’s healthy so I’ll take 2 servings, please! These look delish! 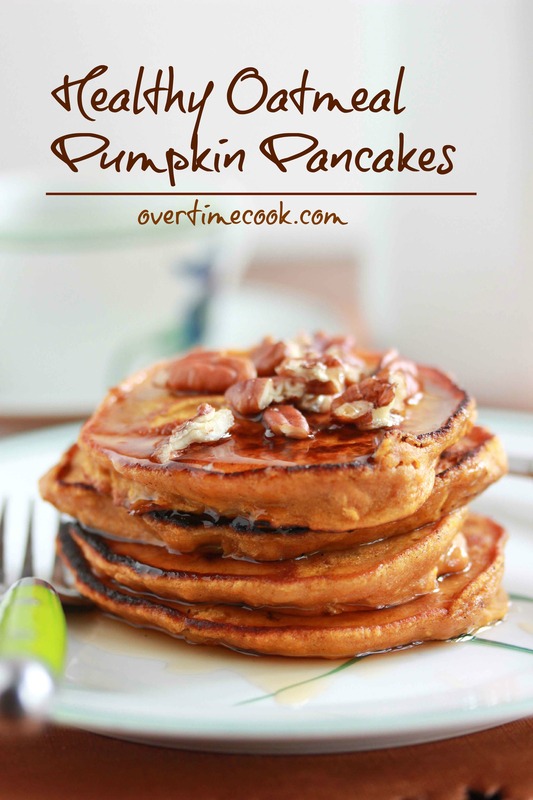 I love how vibrant the pumpkin makes the pancakes! I just have the regular pumpkin for pie, not the puree. Will this recipe work with the pumpkin for pie? I haven’t, but it should be ok. Use less (if any) sweetener though because its sweeter. I did not have good luck with this recipe. Pancakes were too soft – tasted raw in the middle, no matter how long I cooked them. Hi Suan- I’m sorry it didn’t work you you. I’ve never had that problem any time that I made these, but I would guess you need to cook them at a lower flame. do you grind the oatmeal or leave it whole? if whole then how do you sift it? It should say whisk, not sift. I just changed it. No need to grind, the oatmeal gives it a nice texture! See email and changes made to recipe. They’re excellent now! Any nutritional info! WW points? Wanna make these for Christmas morning! Sounds delicious!! My kids loved these. I used egg nog in place of milk and applesauce instead of oil also whole wheat flour. Yummy! We’re celebrating a return to post-holiday sane eating on the Shine Supper Club this month and a recipe like this would be a lovely contribution. Hope you’ll join us! Way to go. Keep up the great work. How many pancakes does this recipe make? They look great! Can you sub flour for coconut/almond/quinoa flour? Milk for almond milk, and coconut oil for canola? okay, i admit, i was verrrry worried for the outcome of these pancakes when the batter didn’t pour and even trying to spread it took learning technique! i had faith. faith in you, overtimecook! and thank overtimecook i did! these pancakes are AMAZING. delicious and healthy! wow. thank you so much for these spectacular pancakes! These are awesome – and kiddo approved. I did find I needed to cook them at a lower temp. for a longer time so they inside completely cooked. Also, vanilla yogurt (real yogurt, not sugary “dessert” yogurt) is another delicious topping. I just made these this morning for Father’s Day, and they were AWESOME!! Filling, tasty, and no guilt:) Thank you for sharing this great recipe! These were great! As others mentioned, figuring out cooking temp and time is key! I used half Splenda and half regular sugar and all whole wheat flour. Topped with blueberries and sugar free syrup, delicious! These sound wonderful and healthy too! I’m going to try them soon and use stevia as a healthier sweetener… not sure how much stevia to use, as it’s much sweeter then sugar. Artificial sweeteners are quite bad for one’s health, so it’s beter to use stevia or old fashioned sugar! Thank you for this fabulous recipe. I can’t wait to try them this fall. Just made them this morning (used pumpkin pie spice instead of ginger and nutmeg separately) and they were a HIT! Will definitely make these again. Thank you! Trying these is on my list for this weekend! Thank you for sharing this wonderful recipe! I am glad to have found your blog. I am also going to be posting a Halloween post on my blog and I will include a selection of a Fall baking recipes from different sites. I would like to put a link to your recipe as well. Please let me know if that might not be fine. Made these this evening 🙂 tasted great, but I had the same problem as someone mentioned. They seemed mushy (although I knew they were cooked) and they were super thick. I added water to the last cake and I think it was a bit better. Also, it could have been the fact that I used whole milk. I will definitely make these again but use almond milk instead. Thanks for a great recipe! Just made these but only half the recipe since there are only 2 of us. I used applesauce instead of the oil and made the batter thinner with more milk since other comments said they didn’t cook all the way. I spread them out and cooked on lower heat. They were excellent. My husband said they were a keeper! These were great! I made them for my mom’s birthday this morning (with a side of bacon). I just made these. They are delicious. I switch the milk for almond and it still came out well. Made these with regular AP flour and evaporated milk instead of regular (as these were the ingr on hand), with just a bit less sugar since the milk is sweeter. Also added about a 1/2 tsp vanilla extract. They were AWESOME!! I actually ate mine with no syrup because they had just the right sweetness. Couldn’t convince my 4 yr olds to do the same, but they said the recipe is a keeper. These are delicious! This is my second time to make them; my kids ate them without any syrup! I only have quick-cooking steel cut oats. I wonder would these work? Or be too chewy? Not sure that’s a great idea – I would go for regular oats. How would this recipe hold up in a waffle iron? I was thinking some shredded carrot would add a little crispy touch too. Thank you! 🙂 I made a few changes, but I really liked these. They’re a keeper! I even ate mine plain. I’ll add more spices next time though. These are yummy. ..substituted oats with granola and oil with apple butter. A little twist on it. Thanks for the recipe. Can I puree butternut squash instead of using canned pumpkin puree? I have cubed squash already in my freezer.. Awesome recipe!!! So so yummy, my boyfriend and I were in love with them. I made a few substitutions that turned our just great: I used raw whole milk for the skim, about 2tbsp honey for the sweetener, regular whole wheat flour, and coconut oil instead of canola. We can’t wait for round two! Thanks for the recipe! It is good to vote. Women fought long and hard to have the right to vote. Not everyone needs to be political but our votes are what shapes our country and freedom. These are spectacular, hearty and delicious! My husband loved them, too! I used erythritol for sweetner, almond milk, and a little bit of regular flour to lighten the texture. I did grind my oatmeal, but that’s just my preference. I sprinkled chopped pecans on before I flipped them. This will be a go-to recipe. These are impressive and easy! Win-Win!!! Can weight watcher points be calculated for this recipe? Made these this morning. They were delicious but I SIGNIFICANTLY cut back the sugar – I think I used 3 Tbsp -and I still found them too sweet. Next time I’ll do 2 Tbsp sugar. I also used cooled melted butter instead of oil.